Description: A cool curvaceous styled pendant, Gravity features a dome-shaped shade highlighted in a stunning Brass Tinted finish. The richly appointed exterior and matching interior result in a warm, burnished glow. Handcrafted by highly skilled artisans in our 180,000 square foot manufacturing facility in Yorkville, NY. The pendant has an overall height which can be adjusted easily from 45 to 85 inches. This pendant is offered with custom styles, finishes and sizes. The fixture illuminates with a Customer supplied, GU24 12-watt compact fluorescent lamp (CFL) and is available with other dimmable energy efficient lamping options. 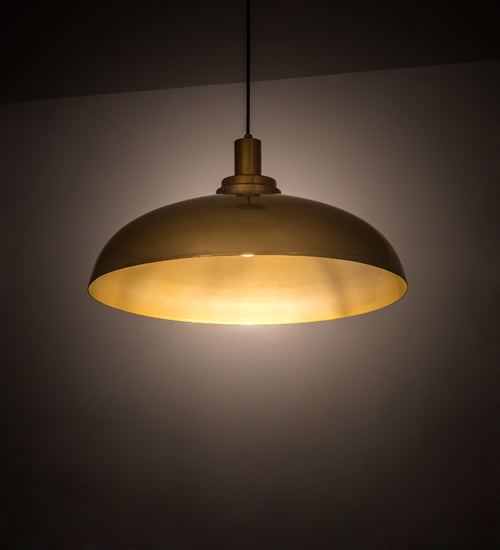 The 23 inch wide pendant is UL and cUL listed for dry and damp locations.